Who said Albanians don’t have class and a taste for fine things!! 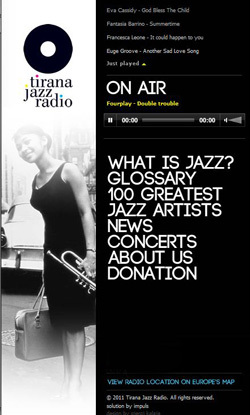 For me, the Tirana Jazz Radio is a fine proof of just that fact. I was so enthused to find out about this little known online radio, which broadcasts such music all day long. It is great for listening to while working in front of a computer, or working around the office or at home, at any time of the day. Don’t forget to bookmark it. Happy listening! Next articleReady for the next stage in my life!